God’s will…in heaven…perfect; on earth…not so much. God’s will is what He desires, purposes, and has determined to be done on earth. It is His established kingdom rule in heaven being accomplished on earth by, for, and through His people. God reveals His will in several ways. One way He chose to reveal some of His will is in His Word. He first gave His revealed will to His people Israel through the Law as a standard of righteousness. Believers in Christ are not under that Law, as Paul told the Roman church, “You are not under law but under grace.” (Rom. 6:14b NKJV) As God has offered us grace through Christ, He is now our ultimate standard of righteousness. Do we truly seek God’s will and to live according to His standard of righteousness? What are we not to do? Are we seeking our own fleshly will or God’s holy will? Are we seeking the will of God with all our hearts? What is the proper response of God’s people? * To act with Godly behavior. Learning to let go of our tight rein on our lives is essential; handing the reins over to the Lord and His will may seem scary but being in God’s will is the safest place on earth. Isn’t it more advantageous to be in agreement with His will? 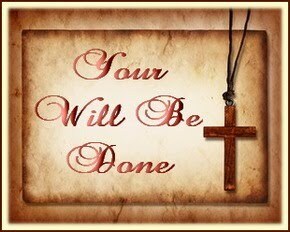 ~~Lord, Your will be done! Great post Lynn. I pray often: please, don’t let me miss your will, don’t let me miss it! Being in His will is the best place to be. Bless you Lynn, thanks for sharing the word with us. Hey, dear Marja! Thanks for being such a sweet supporter. You’re a sweetheart! Love you! My reply: Yes! Praise HIM! I enjoy reading your blog and the incredible encouragement I get when i read. I love how we can all share the word of God through this blog world. Many blessings sister in Christ! Thanks, Deborah, for always leaving a sweet comment! Blessings to you! Hey, Kimberly! Hope you are doing well. And I agree with your answer! Amen! Blessings, dear one! Hello, ML! I’m always glad to see you here. Thank you for taking time to read and comment. I love hearing from you! Be blessed!